Travel e-commerce players, including airlines, are trying to cut down on the margin of error in case of accepting or declining a transaction. So as they review an order they decide appropriately on what action to take. In this context, the role of data that can help in combating fraud is coming to the fore. Data is being relied upon for answering key questions, for instance, why genuine customers are being blocked. Or how historical data can be used to improve the accuracy of any prevention strategy? How is transactional data being capitalized upon via one system and analysis model? How merchants are gearing up for automated, scalable fraud prevention? Another area is how airline-specific data, be it for the activity on their respective websites or other digital assets or transactional data from direct and indirect channels, can result in better fraud prevention. As for the sort of data that can be collected, it boils down to two types - industry data and unique merchant data, according to Justin Lie, who has built CashShield, a SaaS based self-learning fraud prevention solution for ecommerce. · Industry data includes information on coordinated fraud attacks, which may be shared across different airlines as all airlines are equally vulnerable to coordinated hackers. · Unique merchant data would vary from airline to airline, based on the individual information each airline collects or is able to provide. When it comes to collecting more data, unique merchant data from Airline A may not be useful for information on the fraud risks Airline B would be exposed to. “For unique merchant data, we will guide airlines to look for useful custom fields that can increase the accuracy of fraud detection. Also, we will allow airlines to data dump whatever data that may be collected, as more relevant data points can strengthen our real-time pattern recognition technology. Industry data on existing or current fraud attacks can also be useful information to share from airline to airline, but both types of data should be collected for analysis of anomaly detection,” shared Lie. As Lie pointed out in one of our previous interactions, a majority of fraud offerings have been worked out for mass markets, where most carriers are mainly required to garner data based on a template that evaluates only a restricted number of fields. He added that this isn’t enough. It also restricts an airline’s ability to craft an optimal data strategy and reporting for their performance/ return on investment. Unfortunately, not much useful data is returned to the merchant by default. Rather airlines need to go for better control of their data, including one related to a transaction. Lie says airlines can tap on smarter solutions that can customised unlimited data collection to maximize its fraud prevention, automation and false positive reduction capabilities. “For instance, passive biometrics data including mouse cursor movements, keystrokes, words per minute or activity data including wishlists, purchase history or even seemingly insignificant data points like whether or not the user has chosen to subscribe to the newsletter can all be relevant information collected and used. 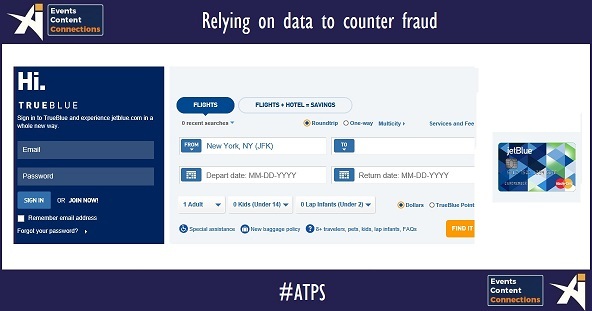 With the data collected, airlines can churn the data through various permutations and combinations to identify potential fraud patterns that may be left behind by fraudsters, who have made micro-changes between transactions in one coordinated fraud attack to trick the system. Using real time pattern recognition, even micro-changes can be proactively identified and tagged to the same fraud pattern group,” explained Lie. It is imperative for airlines to sharpen their fraud prevention strategy, as it is just not about credit card fraud or payment-related anymore. So rather than only securing payments, there is also need to protect accounts and monitoring loyalty miles claims. So how should an airline go about allocating resources for overall fraud management? Where do airlines tend to fall short? Travel e-commerce entities need to apply big data and real time machine learning not only on securing payments, but also for securing accounts and monitoring loyalty miles claims. Lie said considering that airlines have a very low profit margin per transaction made, each fraud loss impacts the airlines significantly. Yet most airlines continue to rely on human labour, which contributes to overall costs to the business on top of fraud losses from ineffective fraud solutions. Airlines should seek to automate their fraud screening processes for greater efficiency as well as to concentrate their focus on other parts of the business. Adopting risk-averse tactics (such as keeping fraud to an absolute minimum) also eats away at an airline’s revenue. Instead, airlines must adopt an optimal risk management approach to its e-commerce strategy to fully maximise its revenue potential. Data definitely has a role to play, and while data is important, what is more important is the quality and relevance of the data. Relevant data is necessary to improve fraud prevention, as well as to improve the machine. For instance, if the machine is regularly receiving non-relevant data, the resultant output will be non-relevant decisions. In addition, the way the data is processed must also be relevant when making probabilities of fraud risk. Also, instead of implementing a fraud prevention strategy that requires long gaps in training machines with data sets, travel companies should shift towards real time machine learning (or real time automated) fraud systems to get ahead of the fraudsters.